High consistency hydrapulper is used for breaking the waste paper in high consistency. The rotor combines triple-flighted and dentiform fly bar and produces intense fiber-to-fiber friction, so it can speed defibering of the waste paper. 2. 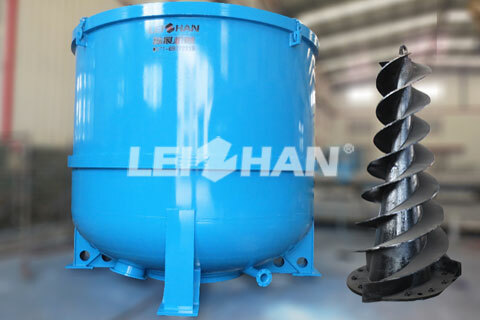 Special spiral rotor effectively promote the circulation and rollover of pulp, reinforce friction between fibers. Finally achieve gentle pulp under high consistency, impurities will not be broke in the process of fiber relief and deinking. 3. Dealing with 12%-18% high consistency pulp, effective chemical mixture and friction between fibers under high consistency make the ink particle separate from the surface of fiber fully. ZDSG high consistency Hydrapulper is designed with the principle of hydraulic whirlpool. The rotors are structure that double-headed screw combination with knife. when the rotor rotates, the high concentration slurry do radial circular motion, make waste paper hydration and defibering accelerate. During the work, the waste paper are always in a high concentration to defibering, thus contributing to the friction between the fibers, to make the ink ion with chemical additives and fiber separation easily, to achieve the purposes to recycling. In addition, the impeller of rotor are oblique spirochete, the shear effect is weak, only divestitures the impurity in the waste paper, and it will not form of small flakes, so it create favorable conditions for pulp screening. The structural design of novel pulping at high concentrations, has the characteristics of water-saving, energy saving, small footprint, is an ideal equipment for waste paper recycling.